“I love ’em,” I said gripping the seat of the plane tightly. “Well, just picture turbulence as waves you can’t see,” the pilot said with a laugh. The plane was jolted as we passed some high mountains. None of the other passengers seemed to notice, but I cringed with the look of someone who just got a thousand needles stuck in his arm. The pilot looked at me, laughed again, and went back to talking to the other passengers. 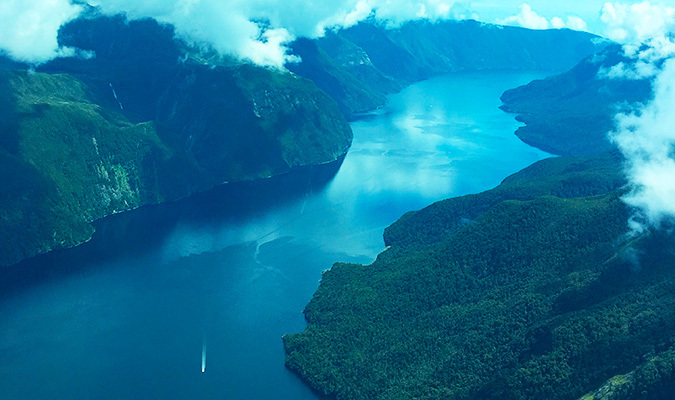 I was in a tiny, six-seater seaplane three thousand feet above Doubtful Sound. 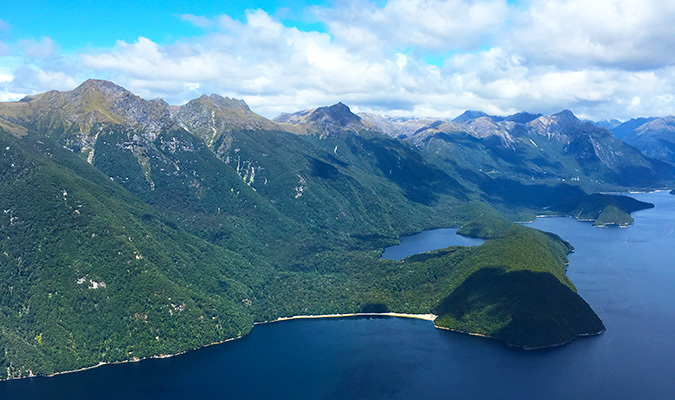 Fiordland is located in the southwesternmost part of New Zealandand home to numerous Lord of the Rings film locations, the region is considered one of the country’s most scenic and remote areas. 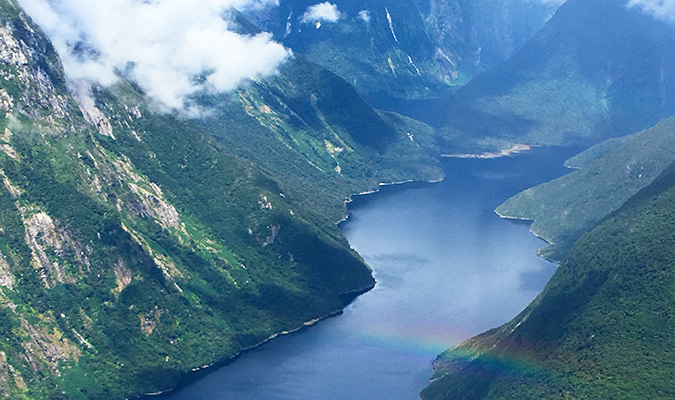 Filled with gigantic mountains, deep lakes, swelling rivers, untamed forests, and resplendent fjords, most of it has never been set upon by man. 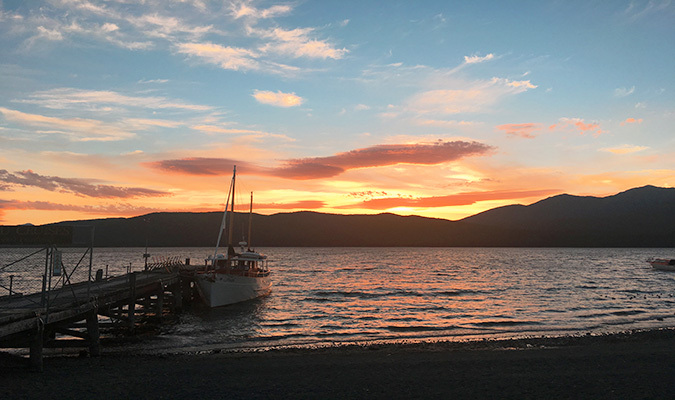 Save a few places where boats and planes can go, the government has made the land off-limits, ensuring that that will be the case for a long time to come. 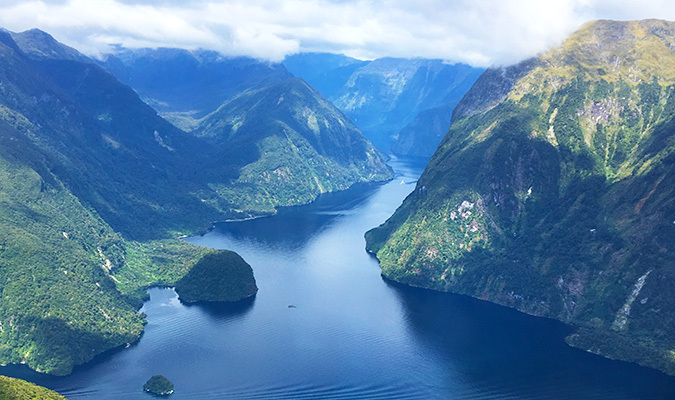 The day before, I had had the bright idea of seeing Doubtful Sound on a quick one-hour flight instead of a full-day bus/boat ride. Despite my fear of heights and flying, I had thought it would be cool and save me lots of time. Yet as the teeny plane bounced around, that no longer seemed so bright. I had hitched a ride to the area with Karin, a Swedish girl I’d met in Wanaka. After a few days partying in Queenstown, we had driven down to the region’s launching pad, Te Anau, a small town of barely a few hundred people on a lake, with lots of campervan parks for tourists who came to camp, hike the Kepler Track and Milford Sound trail, and visit the area’s two biggest attractions: Milford Sound and Doubtful Sound. Karin and I drove up to Milford Sound for the day. On the way, we passed giant granite mountains, crystal-clear blue rivers, and roaring waterfalls. Sheer cliffs rose above us as we followed the road to the sound. Tiny lakes dotted the way, and hiking trails — some of the country’s “Great Walks” — crisscrossed the area. 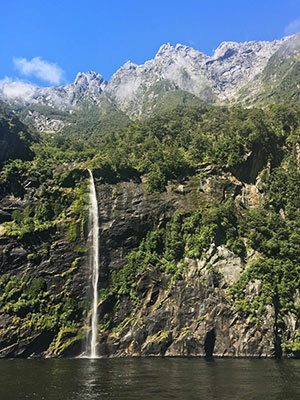 This was wild New Zealand, where cellphone service didn’t exist, you had to camp, and, to quote Doc Brown, “you don’t need roads.” You came here for one reason: to escape city life. 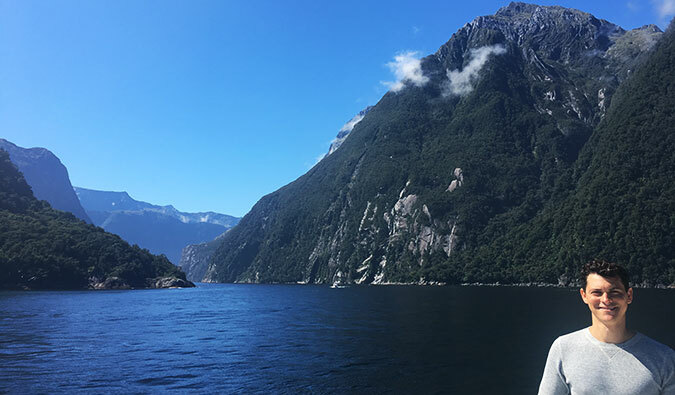 On our two-hour cruise on Milford Sound to the edge of the Tasman Sea and back again, water from the recent rains rushed in a torrent off the sides of the fjord, ice covered the tops of the mountains, and seals frolicked nearby. It was a clear, bright, sunny day, the kind that makes you feel like you got the luckiest card in the traveler’s deck. The next day, Karin left but I stayed on. I found an Airbnb run by an older couple, complete with a garden, sun deck, and hot tub. However, they had quirky nature, and it was clear that they weren’t that hospitable or used to young travelers booking via Airbnb. From the odd blackmail (“if you want to use our kitchen, maybe you can book your tours with me”) to the reversal of that offer (“I changed my mind”) to the immediate outpouring of personal information to the shock that someone would cook in their kitchen to the constant checking up, they left a bad vibe that made it seem like I never was wanted there. So I got out of the Airbnb as often as possible. I headed to Wings and Water, a small seaplane company run by Jim, a hard-nosed pilot who had a lot to say about the state of modern pilot training and airplane safety. He spouted off about the nanny state and government regulation not letting pilots be pilots, companies outsourcing maintenance, the overreliance on computers and technology, and pilots not going with their guts enough. He had strong opinions on every subject. “Matt is afraid of flying, but we’ll make him a man,” he said to the two other couples waiting to board our flight, slapping my back as he went to do another safety check on the plane. I already regretted having mentioned my fear of flying. With a sputter of the engine, we coasted on the water and ascended smoothly into the air. Now, below us, the giant Lake Te Anau and mountains were splayed out over the landscape. There were lakes leaking down the sides of mountains, patches of ice dotting inaccessible mountaintops, and sheer, gray cliffs with trees seemingly hanging on by a root, ready to slide off at a moment’s notice. We weaved so closely around the mountains I felt I could touch them. As the clouds rolled in, I became nervous. With clouds came wind and choppier air. “You just know from experience,” Jim replied. We cut through the clouds and did a loop around the Browne Falls, the world’s tallest waterslide (since the water technically was always touching the ground, it wasn’t a waterfall), through which the cascade poured incessantly from a large pool set in a depression of the mountain. The next day I snuck out of my Airbnb to avoid seeing my hosts and caught the early-morning bus. As I watched the sky turn a pink as the sun rose, I was glad that, unlike my last visit, I didn’t skip this area. Here in this little town on the edge of New Zealand, where tourists outnumbered locals, there was little else to do but enjoy nature. The region stripped away the distractions so common in other parts of the country. And I also hoped that when I come back, I’ll show Jim I’ve overcome my fear of heights. P.S. – NEW UPDATED GUIDES! As a reminder, we’ve updated 5 of our guides: Paris, Stockholm, Amsterdam, New York City, and Kristin’s solo female travel guide, Conquering Mountains: How to Solo Travel the World Fearlessly. We added maps and language sections to our guides and tons of new tips to Kristin’s book. If you’re going to any of these cities, grab a guide so you can plan your trip, learn how to save money, get off the tourist travel, and find your way around easier!